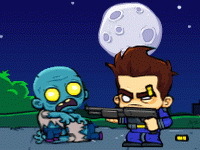 Enjoy an epic storyline and a very fun gameplay in this amazing new game! Your goal is to rob banks from three different cities and escape the police by shooting down their cars and destroying them. As you progress in the game things will become more challenging, the police will upgrade their cars and even the FBI will step in, but you can also buy new cool vehicles for yourself and upgrade them and your weapons so you can perform better.